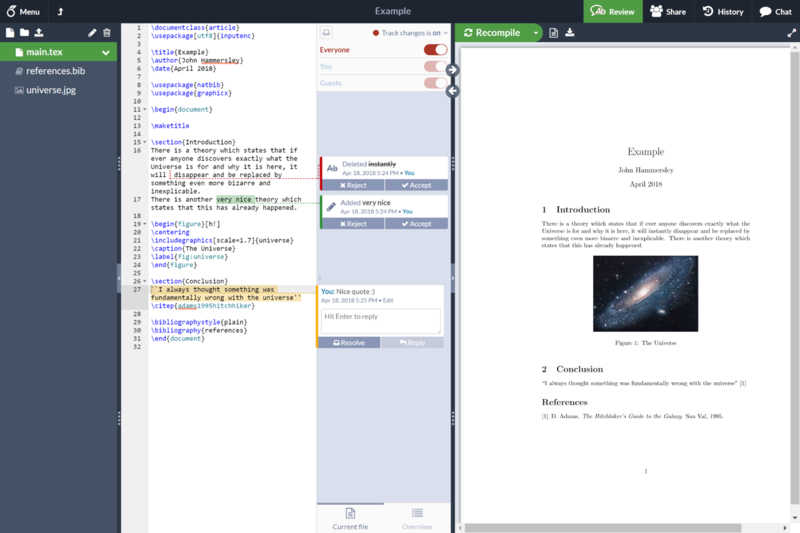 Caltech Library now provides free Overleaf Pro accounts for all students, faculty and staff who would like to use a collaborative, online LaTeX editor for their projects. Claim your free 10GB Pro account on Overleaf by signing up at https://www.overleaf.com/edu/caltech. You’ll need to verify a Caltech email address in order to receive your free Pro account. Overleaf is designed to make the process of writing, editing and producing your research papers and project reports much quicker for both you and your collaborators. Overleaf can also be linked to other services such as arXiv, Git and Plot.ly to best fit into your workflow. Real-time collaboration in your browser for sharing and editing protected projects with authorized users. You can add and remove collaborators at any time. Real-time preview of projects to review your document while editing and writing. Immediate reporting of errors and warnings as you write, so you can catch issues early, and it shows them inline, so you don't have to find them in the LaTeX log. Automatic typesetting of bibliographies within the Overleaf window: no need to separately compile bibliography (.bib) files. Create 'Protected Projects' for added security. You can authorize selected users to have access and can add & remove collaborators at any time.